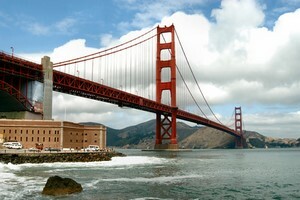 Compare prices on car hire in San Francisco from all the major brands and find the best deals. When you book through us, unlimited mileage and insurance are always included in the price given. San Francisco is located in the state of California and has approx. 745,000 inhabitants. It is the largest city in a sprawling metropolitan area around San Francisco Bay, all in all, is home to 7 million people. Originally, the San Francisco city built on several islands – and also Fallao Islands, about 40 km into the Pacific Ocean, belonging to the city. What many associate with San Francisco, is the cult status of the city got for the hippie movement in 1960 – and 1970’s – and the important role the city and the surrounding area have played in the development of the Internet. Still represents Silicon Valley, a little further south in the San Francisco Bay, the largest collection of computer technology companies in the world. Among the major sights in San Francisco, we find the special tram system (cable cars), which has been in operation since 1873, the Golden Gate Bridge (which in its time was the world’s longest suspension bridge – and still is the city’s most famous landmark), Transamerica Pyramid (a 260 m tall pyramid-shaped skyscraper) – and the prison island of Alcatraz in San Francisco Bay. It ceased as a prison island in 1963, and is currently in prison museum with daily passenger flights to and from San Francisco. The island has been a key arena for many famous movies. The largest airport in the area is San Francisco International Airport , located in San Mateo County – 21 miles south of San Francisco.